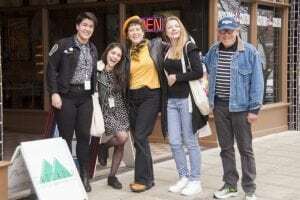 Cheryl Crooks (center) with Everett Aison and CASCADIA filmmakers who came to the 2017 festival. (From left) Victoria Montes from New York, Sofya Badalova and actress Maria Snetkova both from Russia. Photo courtesy: Cheryl Crooks. Nestled in the upstairs nook of Community Food Co-op, Kevin Coleman and I listen intently to the inspiring story of how the CASCADIA International Women’s Film Festival (CIWFF) first started. Carefully dipping her lemon ginger tea bag into her mug, Executive Director Cheryl Crooks passionately explains the humble beginnings of the festival based on the vision of founder, Polly Miller. 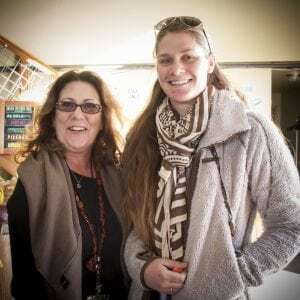 Polly Miller (left) with filmmaker Natalie Fedak whose film, 3022ft., was one of the films screened at last year’s festival. 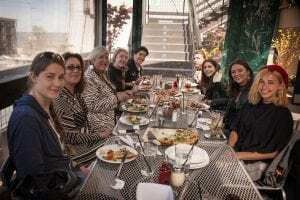 Pictured together at the Directors Happy Hour Welcome at Boundary Bay Brewery. Photo courtesy: Cheryl Crooks. Some of the directors who attended the 2017 festival gathered together for a directors-only lunch to network and share experiences and stories about their work. Photo courtesy: Cheryl Crooks. Both Amy and Cheryl emphasize that CASCADIA is not “chick flicks,” but rather amazing films directed by women that span the human experience. “We want to build a community for women to find mentors and points of entry,” Amy says. “We want to build capital and access for women, to show films and give the opportunities for distributors to pick those films up, and to get feedback from the audience.” Many times directors like these were exiled from their countries in order to tell the truth about what’s actually happening, making it even more important for these stories to be told. Visiting director Leah Warshawski talks with the audience after the screening of her film, “Big Sonia” at CASCADIA’s festival in April, 2017. Photo courtesy: Cheryl Crooks. To help achieve their goal, CASCADIA is bringing in former president of the Academy of Motion Picture Arts and Sciences, Cheryl Boone Isaacs. She is a strong advocate for women and for people of color in the industry. You may remember her from when the Oscars were boycotted by many people of color with the hashtag #Oscarssowhite and several decided to engage in humanitarian efforts instead. It’s important for us to build and embrace diversity and inclusion in this festival and it is an honor to have Cheryl Boone Isaacs attend. This is a big step for Bellingham and CASCADIA. 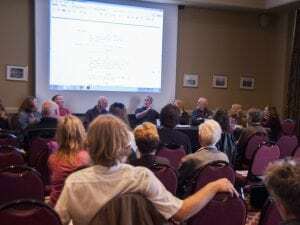 Film industry panelists provide comments to writers on their scripts during CASCADIA’s Script Studio at last year’s film festival. Photo courtesy: Cheryl Crooks. Small investments really have impactful outcomes. Whatcom County film goers can support these directors by attending a film by a brand new director, like the movie “Women of the Silk Road” directed by a woman from Iran who can’t have her story shown or promoted there. Many opportunities can arise from that $12 investment including feedback from the audience, validation for her work and a sense of confidence that people care about the issues these directors put forth. It’s a small, intentional act that could really impact these directors’ work and creative visions. Setting up scholarships to help a director come to the festival is another CIWFF goal. Women from Iran, Afghanistan and even the U.S., who might not have the $15 submission fee, could receive a scholarship, thus providing yet another voice that might not otherwise be heard. If we don’t see it, we won’t know the story. Underwriting hotels and setting up partnerships so that directors have a place to stay is another way that local businesses can support the directors and the festival. If you are passionate about good film making and/or a business owner that wants to be more involved in the community, then CASCADIA could be the right cause to support. How else might you engage with this fabulous community project and advocate for films by women directors? Check out the CASCADIA website and all the fabulous films. 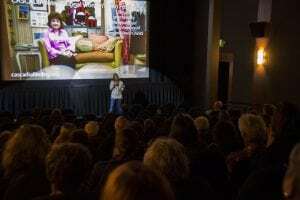 The 2nd Annual CASCADIA International Women’s Film Festival will be held from April 12-15 at the Pickford Film Center. There will be a special pre-festival event on Wednesday April 11 on the WWU campus as part of the Reel World Series presented by the Institute for Global Studies. That film is open to the public and free of charge.